We have gained huge popularity among the clients, as we are engaged in manufacturing and supplying, an exclusive range of Jam Filling Machine. 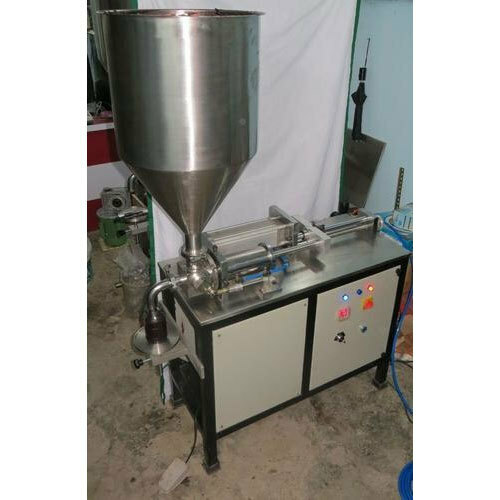 These provided machines are used for high speed and volumetric filling of the products. Since 2000, we Samarth Technology have been engaged in manufacturing and supplying a wide range of Horizontal Flow Wrapper Machine, Filling Machine, Sealing Machine, and much more. The product range is fabricated using the high-grade raw material, latest technology, and sophisticated machines. The raw material for manufacturing these machines is sourced from trusted vendors of the market. These machines are widely preferred by the customers for their user-friendly operation, durability, rugged construction, efficient functioning and wear & tear resistance. These machines are used for packing different types of material like liquid, solid, powder and others, in an efficient manner. Our products are made in compliance with the set industry standards and as per the varied packaging requirements of different industries and sectors. Moreover, we provide customized machines in varied specifications as well as in customized forms. We also check the entire range of machines on certain quality parameters to ensure its flawlessness. Besides, we are widely preferred by the clients for our continued commitment to the customer support and after-sales services.